Spread the word about colon cancer screening! So what’s holding you back from a potentially lifesaving screening test? The fear of the test results—or of the procedure itself? Here’s the thing: colon cancer screening methods have improved, and there are a number of different methods available. So we’re challenging you to overcome your hesitation, stop waiting for symptoms, and get screened for colon cancer. It’s time to get more people out of hiding, get them screened, and save more lives. Still need more reasons to screen for colon cancer? Save a life through prevention: Screening works by finding cancer early before it spreads and when it’s highly treatable. 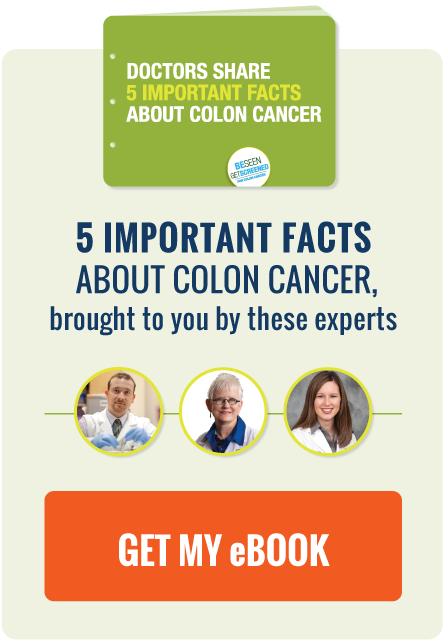 Stop waiting for symptoms: There are often no signs or symptoms of colon cancer until the cancer has advanced. If you wait to get tested after symptoms develop, you might miss the chance to prevent the disease from spreading. Know the screening methods: Did you know that there’s more than one way to screen for colon cancer? Discuss the different methods with your doctor, learn about how methods have improved, and find out which test is best for you. Gain peace of mind: Put yourself at ease and sleep better at night by knowing that you’ve reduced your risk of colon cancer. Prepare for screening with a downloadable discussion guide to take to your next doctor’s appointment.